President Donald Trump is not known for his loyalty. Just ask Michael Cohen, Jeff Sessions, or Michael Flynn. But is he about to turn on his most loyal of lapdogs, Vice President Mike Pence? 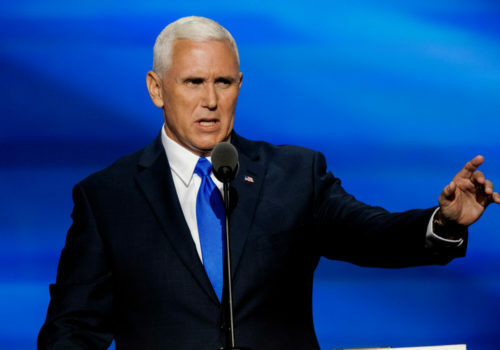 Previous reports have indicated the Trump has been questioning Pence’s loyalty lately, but new reporting suggests he may be considering replacing Pence on the 2020 ticket. And after Trump’s Monday meeting with his advisors, perhaps Pence should be getting worried. The group allegedly showed Trump new polling that showed Pence didn’t add anything to the ticket in a 2020 run. “They’re beginning to think about whether Mike Pence should be running again,” a White House insider told Vanity Fair. Pence, a darling of the religious right, was added to shore up the evangelical vote. Trump’s nonstop pandering to the group, however, has solidified his support to the point he doesn’t need Pence. “He doesn’t detract from it, but he doesn’t add anything either,” the source said. The New York Times previously reported that Trump has long distrusted Pence ever since his 2016 response to Trump’s 2005 Access Hollywood comments admitting his sexual assault of women. Trump’s advisors have suggested he find a 2020 running mate who could help him gain more female voters. An estimated 47% of white women voted for Trump in 2016 (compared to only 25% of Latinx women and 4% of black women). Former South Carolina governor and UN ambassador Nikki Haley has been most frequently mentioned as Pence’s replacement on the ticket. Pence, for his part, isn’t as dumb as he looks. He’s been quietly assembling his own team – including Trump’s former campaign manager, Corey Lewandowski – and has formed a political PAC that could signal his intent to mount his own bid for the presidency.